I am lucky enough to say that my mom is a wonderful Veterinarian, who incorporates alternative medicine into her practice! She does Homeopathy as well as conventional Western medicine, while her other colleagues practice and perform additional: physiotherapy (including the use of a water treadmill), acupuncture, and chiropractic treatments for animals. 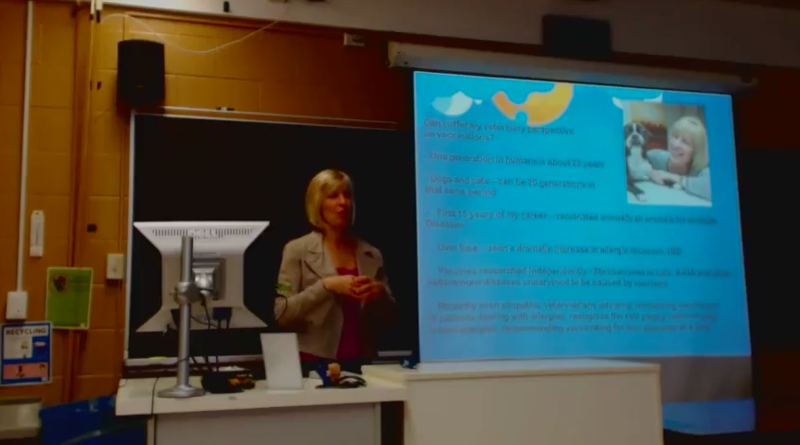 She gave a presentation at my Medical school regarding Homeopathy, but ended on the discussion of vaccines in animals. I found that this was a very interesting perspective on the topic, as she has been fortunate enough in Veterinary medicine to see approximately 8+ generations of animals in her lifetime, and the effects that vaccines have had. This is in comparison to the limited 1-2 generations of people we will see in our lifetime. Being able to evaluate the outcomes of these interventions via seeing the long-term and lasting effects throughout the years, enables the Veterinary community to almost be ahead of the human population in terms of what they know about optimal vaccination protocols. Change has occurred within the animal population, and it may be a sneak peak of what is to come with our society. I encourage you to keep an open mind, take everything with a grain of salt, but truly consider the possibilities of our future with vaccinations from a human standpoint extrapolated from this discussion on animals. Take a look at her presentation on YOUTUBE, under the key words: Vaccine Michelle Sthamann. It should be the first video that appears. Michelle on The Five Keys to Happiness by Bishop T.D. Jakes! Brighton Makoni on The Five Keys to Happiness by Bishop T.D. Jakes!